Editor’s Note – This article was first published in 2017, but we’ve done a full 2019 update to make sure all of the information below is still fresh and up-t0-date. Looking to redesign your kitchen, and want to avoid a chunky microwave taking up your valuable counter space? 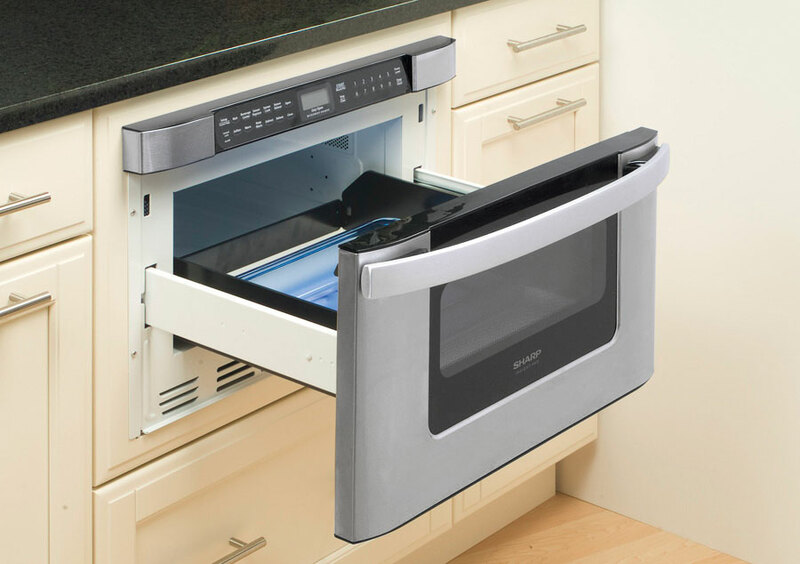 These drawer microwaves are the perfect solution. 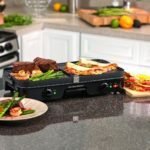 Not only are they unbeatable space-savers, they really add a ‘WOW’ factor to your kitchen, and come stock full of power and functionality, too. Drawer microwaves were pioneered by SHARP, who were the first manufacturer to sell them in America. To this day, they’re still the biggest drawer microwave manufacturer out there. While there are some other companies giving them competition, we’ve found in our research that those models are actually based on SHARP designs. With that in mind, we’ve compared and contrasted between all the best models on the market, and are proud to bring you our review of the Best Drawer Microwaves in 2018. Our top pick is one of Sharp’s latest models – the SMD2470AS (on Amazon here). It’s not as brand new as their latest model (the SMD2470AH; note the last letter), but it has the same fantastic design and functionality. All with a lower price tag. We love the minimalist design, and how the controls can be totally hidden away. Check out those controls: they get hidden when not in use. If you’re after the best bang for your buck, then check out the Sharp KB-6524PS (on Amazon here). It was the drawer microwave for years until Sharp’s newer models came out in 2015. It might not be brand new, but it’s still amazing. It’s not fresh off the press, but you can’t get a better model when it comes to value for money. It’s proven from years of being the top model: reliable, and still has all the main functionality – including a keep-warm function and touch-to-open drawer. 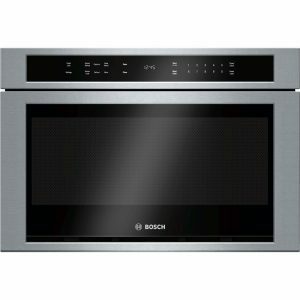 While drawer microwaves are unbeatable in how sleek and modern they are, they are definitely not a cheap solution. You should make sure that the drawer microwave you buy is going be right at home in your kitchen. To help find the best match for you, we’ve outlined a few key features below. Knowing which features are important to you makes it easier to find the right microwave to buy for your kitchen. Looks – Appearance is of course important, but not just these pictures. Relative to the rest of your kitchen, how will the design look? Will the colors match? Do you want the display always visible, or would you love to be able to hide it away? Size – Will it fit inside your cabinet? Standard models typically come in 24” or 30” widths. Make sure to get the measuring tape out and do a quick check! Specific dimensions can always be found under ‘Product Information’ on the Amazon page. Extra Features – Are you in the market for more than just a standard microwave? Look for features like child lock functions and warming modes to keep food warm. Not to mention the always-impressive touch-operated microwave drawers. Ease of Use – Consider how intuitive the controls are. Will you need to bend down to see them? If there’s plenty of features and modes, will they be easy to select and use? Make sure you’re not paying extra for features you won’t use. Our top recommendation - combining fantastic looks, great ease of use, and all-around quality. 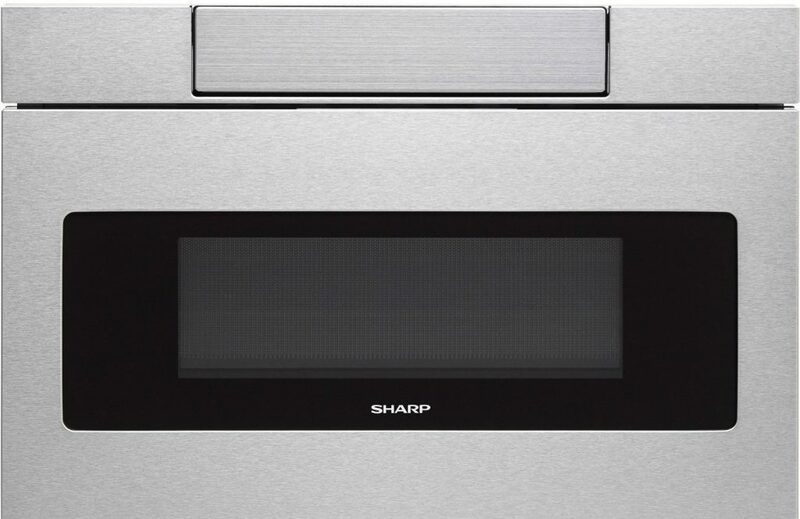 As we said in the introduction, Sharp are the original pioneers of drawer microwaves. And they still produce the best-selling models today. Nowadays, thanks to this new design, they really have the market covered with three different variations on the same models. We call this “the triple threat”, because if you’re in the market for a drawer microwave, one of these three microwaves is probably just what you’re looking for. All the benefits of a great microwave, without looking like you even have a microwave. This microwave was the first of the new models to be released. It’s been truly designed for the modern kitchen. The ‘hideaway’ control panel means that the entire appliance stays flush with the rest of your cabinets, when not in use. It just fits in so well. That’s not to say you’ll lose out on any functionality. This is one of those rare products that looks stunning, while still performing at the highest level. Boasting 1000 watts of power and a huge drawer to work with (1.2 cubic feet), this sleek looking microwave is actually a real powerhouse. Stocked full of state-of-the-art features like digital displays, control locks, touch controls and food warming, you’ll wonder how your kitchen ever seemed complete without one. This model is, in our opinion, the best drawer microwave on the market right now. 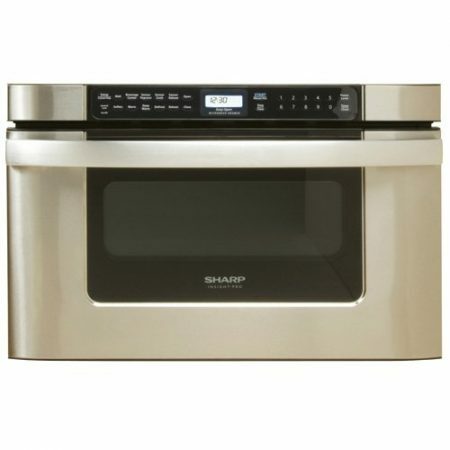 Next up, Sharp released a 30” variation on their new model (up from 24″). 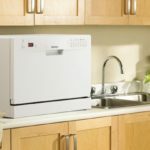 This features all of the same functions and capabilities, but has a wider size and shorter height – giving the same microwave drawer volume (1.2 cubic feet). When comparing the SMD3070AS to the SMD2470AS above – they’re just as good as each other. It all just depends on what kind of dimensions will fit your kitchens (and cabinets) better. If a wider version would suit you better, have no hesitation that this is just as good as our top recommendation above. Check out this ‘wide’ drawer microwave on Amazon here. Back in black – the newest drawer microwave on the market. Fresh off the press. This is SHARP’s newest model, which came onto the scene at the end of 2016. It comes in a super-stylish black steel, which looks far better than any microwave should be allowed to. This new version doesn’t add anything major in terms of functionality, aside from a few internal tweaks and improvements, but is an absolute show-stopper in terms of looks. A must have if you’re in love with the color, and don’t mind the extra price tag. Check out the ‘latest and greatest’ on Amazon here. Between these three models, you have the ideal options for what most consumers look for in a drawer microwave. With the two original models, you’ve got great functionality and capability, as well as a fantastically modern and contemporary design. The two different sizes let you make sure they will fit snugly into your kitchen. 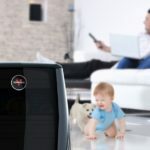 Then the latest model, the 2470AH, just blows us away in terms of looks – it’s like the Lamborghini of microwaves. That distinct Bosch quality look and feel. 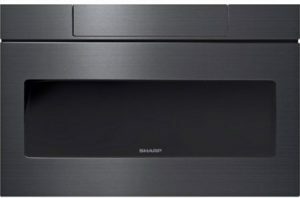 In rolling out their own drawer microwave to compete with Sharp, Bosch have met the standards that they’re known for – providing a sleek looking, luxury, and high-quality product. Its contemporary lines and display, as well a design that it will let it sit flush with your cabinets, means this drawer microwave will be at home in any modern kitchen. 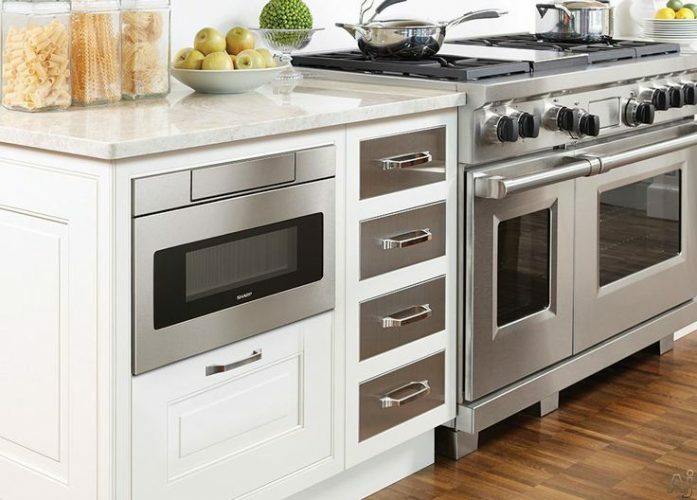 10 varying power levels, automatic sensors to guarantee perfect cooking/defrosting, and of course an automatic drawer which slides open at the touch of a button. Our only gripe is that, for whatever reason, the LCD display doesn’t have a backlight. While it looks crisp and clear in normal lighting, it can be hard to see under strong light (or if you’re doing some late-night microwaving..). This model is everything you’d expect from Bosch. It looks great, it’s in the top tier when it comes to functionality, and its stock full of luxury features. If you’re a fan of their products, this is a fantastic inclusion to give your kitchen design a level up. This model was Sharp’s first drawer microwave that really broke through and succeeded on the market. And it’s still selling strongly today. That being said, just because it isn’t fresh off the press doesn’t mean it’s lacking in features: The drawer opens automatically at the touch of a button, a “keep-warm” function for up to 30 minutes, 11 power levels, 1.2 cubic foot capacity, and the controls are actually mounted on at a slight angle; so that they’re easier to see from above. All this with a lower price tag thanks to having been on the market for a while (since 2009). If you don’t mind the older looks, you’re not losing anything on functionality. A fully stocked drawer microwave at an unbeatable price. It’s got just about the same functionality as the newest models, and it still looks great. Since it’s a bit older, we recommend picking up the extended protection plan from Amazon; just to make sure you’re covered in the long run. In this guide, we’ve outlined the best drawer microwaves on the market today – and hope that our reviews will help you find that right model to bring your kitchen to the next level. There’s few other appliances that have such a ‘WOW’ factor than a full-sized microwave drawer which glides out with a touch of a button. We hope you’ve enjoyed this post. If you did, check out the related posts below for others you may like. We’d love to hear any feedback you have – shoot us a message here and we’ll get back to you. Have a nice day!